First it was the absence of defense. Now the Huskies can’t shoot the ball. If they can’t get it together in two road games in Oregon, they can work on their problems in the relative quiet of the NIT. Throw the NCAA tournament bracketology out the window. That’s what Lorenzo Romar has done with his freshman-heavy squad ahead of a road trip to face Oregon State Wednesday (8 p.m., FOX Sports 1) and No. 13 Oregon Sunday (5:30 p.m., ESPNU). Not that Romar isn’t worried about his team’s hopes for the big dance; he has more pressing concerns, in the form of shooting slumps for some of his big producers. Romar has his hands full getting players focus on the present, rather than worry about the future. “(Putting too much significance on a game), you don’t want to create that,” he said. “We need to be concerned about what we’ve been concerned about all year. The guys are going to hear (about the tourney) enough, from their family, their friends, social media, ESPN . . . . constantly they’re bombarded with, ‘Well. if you win this one and then they win that one,’ they hear that enough. The Huskies are a far cry from the “all you can be” mark. The bench scored only two points in an ugly, 64-53 win over Stanford Saturday, and those came from the free-throw line. Dominic Green and David Crisp were the worst offenders; both whiffed on all seven of their shots. Crisp, in particular, has been relied upon to supplement Washington’s bench scoring as a viable sub for Andrew Andrews or Dejounte Murray, allowing the starting guards to rest. Lately, though, things haven’t been going Crisp’s way, as his three-point shot has abandoned him. Crisp is 2-of-19 from beyond the arc in his last seven games, averaging fewer than two points a game. Andrews said that, as a captain, his job was to try to help struggling teammates. Andrews is in need of a little support of his own. The senior, after a blazing start to conference play that has him perched atop the conference scoring race, has lost track of his own shot. 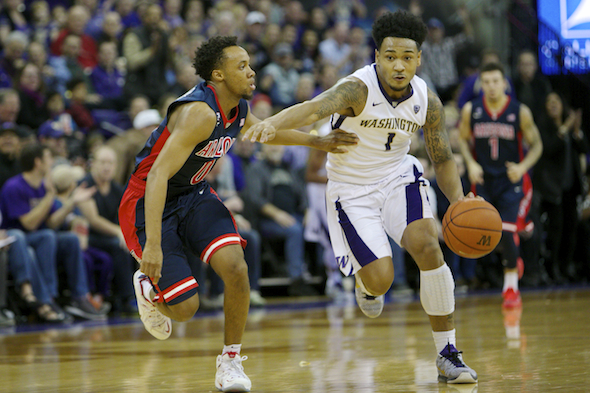 Andrews was 0-of-4 from the field against Stanford, but will hope to return to the 19.5 points per game that he averaged during the Huskies’ losing streak. The news is not all bad for Washington, even as they go to face Oregon State (15-10, 6-8 Pac-12) which has lost three times at home. Malik Dime, now a starter, is displaying much more confidence on both sides of the ball, and Murray appears to have resumed his traditional flashy ways. If the Huskies pull out of their funk, Romar will be right not to worry about tournament concerns. If the shooting woes continue, pressure on other players to carry the burden may prove too much. The Huskies have more to be concerned about than their shooting. The Defense and Rebounding has been very poor recently that has directly led to recent loses! Until they learn to play D and get reboiunds, who cares about O? It’s the same Romar team we have watched for too many years. Time for him to move on. …❝my .friend’s mate Is getting 98$. HOURLY. on the internet.”….two days ago new McLaren. F1 bought after earning 18,512$,,,this was my previous month’s paycheck ,and-a little over, 17k$ Last month ..3-5 h/r of work a day ..with extra open doors & weekly. paychecks.. it’s realy the easiest work I have ever Do.. I Joined This 7 months ago and now making over 87$, p/h.Learn. More right Here:;/316➤➤➤➤➤ http://GlobalSuperEmploymentVacanciesReportsJobs/GetPaid/98$hourly…. .❦2:❦2:❦2:❦2:❦2:❦2:❦2:❦2:❦2:❦2:❦2:❦2:❦2:❦2:❦2:❦2:❦2:❦2:❦2:❦2:❦2:❦2:❦2:❦2:❦2:❦2:❦2:❦2:::::;/316…….